When I’m not on Vigilant, I’m usually at The Bay Club Golf Course. It’s a really special club; it’s a great course, great people, incredible staff, and for some reason, it’s almost never crowded. If you like playing golf with nothing but birds chirping in the background, you’ll love the Bay Club. But if you’re looking for a gang of golfers to put together a big game you might get a little lonely there. I love it because I like to play fast and 3 hour rounds are a regular treat. I also love it because it has led to a number of close friendships with the other members who are there looking for the same thing. 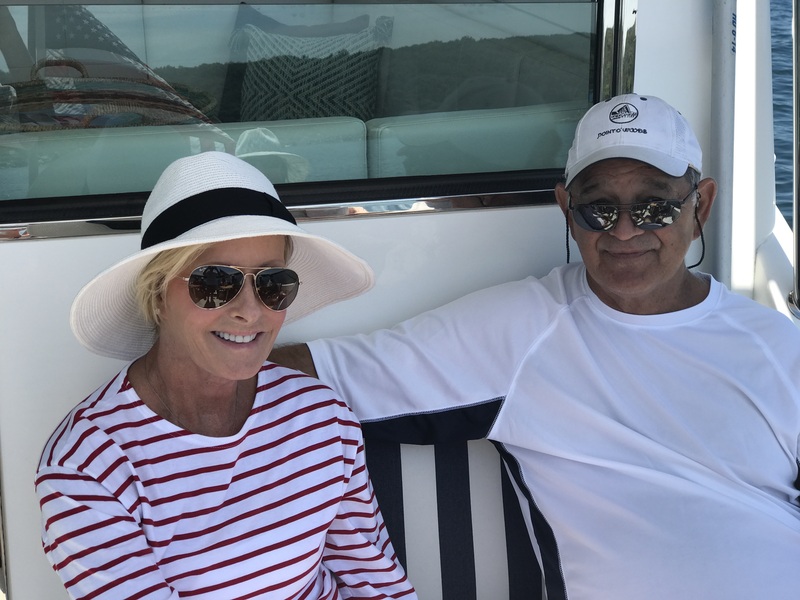 Due to Mrs. Horne’s family commitments and our mutual interest in spending as much time as possible on Vigilant, we haven’t been at The Bay Club as often as usual this summer. But when we are there, our golf friends frequently ask us about the “new boat”. So we decided to take them out on Buzzards Bay and show them first hand. We’re not the only boating members at the Bay Club. Last year we did something similar with our friends Jon and Joan on Tenacity and their Pursuit 34 – True North. It was fun. 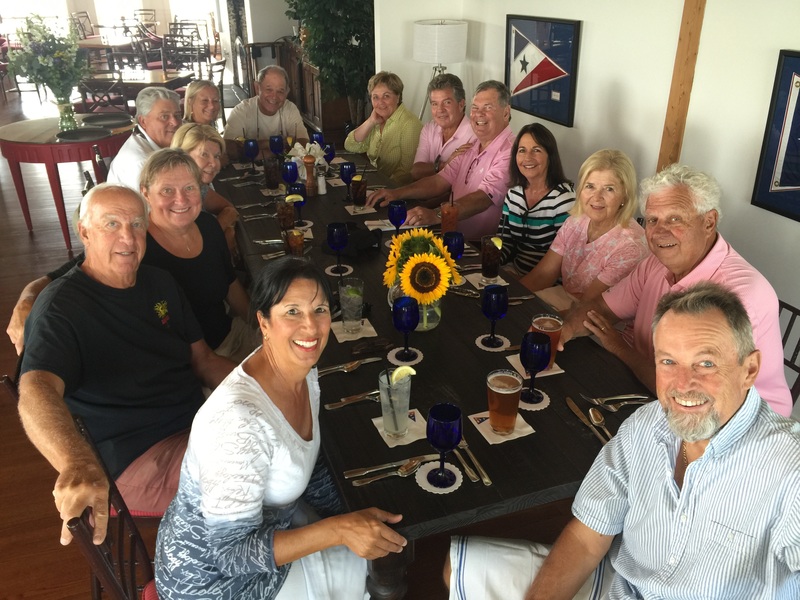 We each took 3 other couples and went to the Sakonnet Club in Rhode Island for lunch. It was fine, but still it was lunch in a restaurant with a dozen other people. After lunch we “gunkholed” off Cuttyhunk and that was really a lot more fun. The margarita’s came out. Larry asked me to play guitar and suddenly everyone was really enjoying a Buzzards Bay moment. This was clearly a great idea and one that deserved to become an annual affair. Early this season, we set the date of August 8 and started inviting friends. Jon and Joan were also inviting friends and together we hoped to have 16 again. As soon as the words left Tony’s mouth I remembered how the mood changed when we anchored off Cuttyhunk and knew he was dead right. 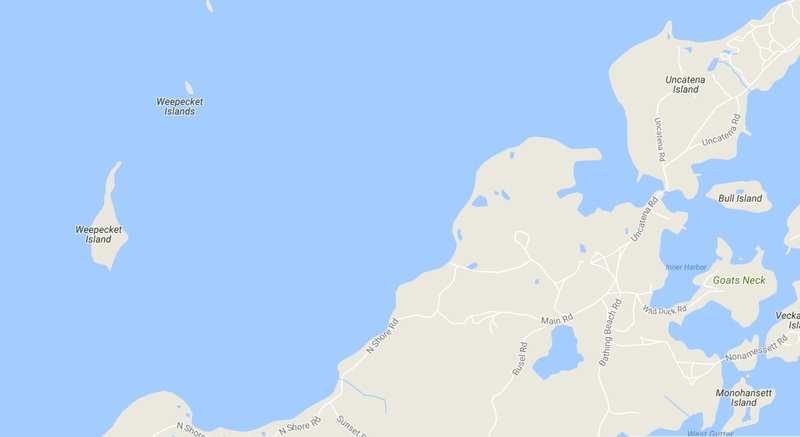 The plan would be to gunkhole somewhere, raft the boats, and do a floating pot luck lunch on Buzzards Bay. As I’ve said before, making boating plans on Buzzards Bay is futile and August 8th was no different. A few weeks before Jon came up lame with a serious knee problem and his boat and crew were suddenly out. 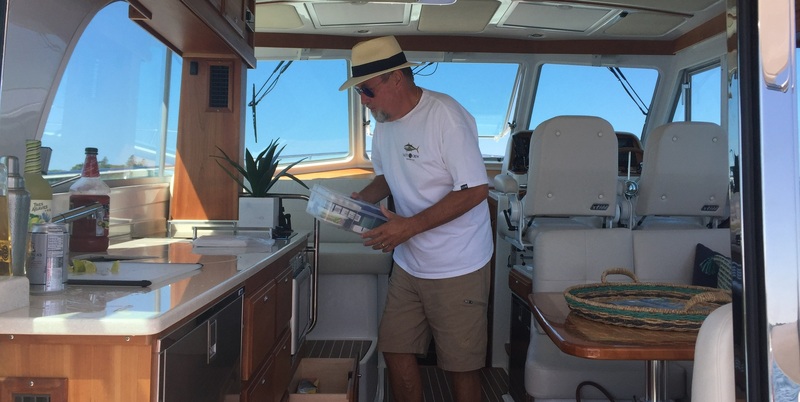 Fortunately, Ellen and Paul stepped in with Dulcet – their East Bay 39, to be the 2nd boat. They invited 3 other couples to join them. Again, the plan fell apart when August 8th turned out to be cloudy and cold. Mrs. Horne and Ellen decided around 9:00 to postpone it a day since the forecast for the 9th was perfect. As Mrs. Horne and I start talking about what we’d do with our newfound day off Mrs. Horne’s iPhone chirped with a message from Ellen. Elaine, Ed, Chris, and Steve didn’t get the email about the reschedule and they were at the dock in Padanaram ready to go. Ellen and Paul decided to “make lemonade” out of our broken plans and instantly hosted a party at their slip at South Wharf. Even better, they invited us to join them! It was a great way to spend a cloudy day and by 4:00 that afternoon the sun was shining and it was the beautiful day we had hoped for. More plans went awry as all 3 of the couples on Dulcet had conflicts on the 9th. It didn’t make sense to have Ellen and Paul go out by themselves, so we invited them to join the rest of us on Vigilant. Tony, Liz, Dennis, Angela, Paul, Ellen, and Bob all arrived just before 10:00 – our scheduled departure (Bob’s wife Sue was under the weather and made the tough call to sit it out). We were planning to head to Tarpaulin Cove, but once we got started, that seemed a little far to go. Also, the wind might not be right. 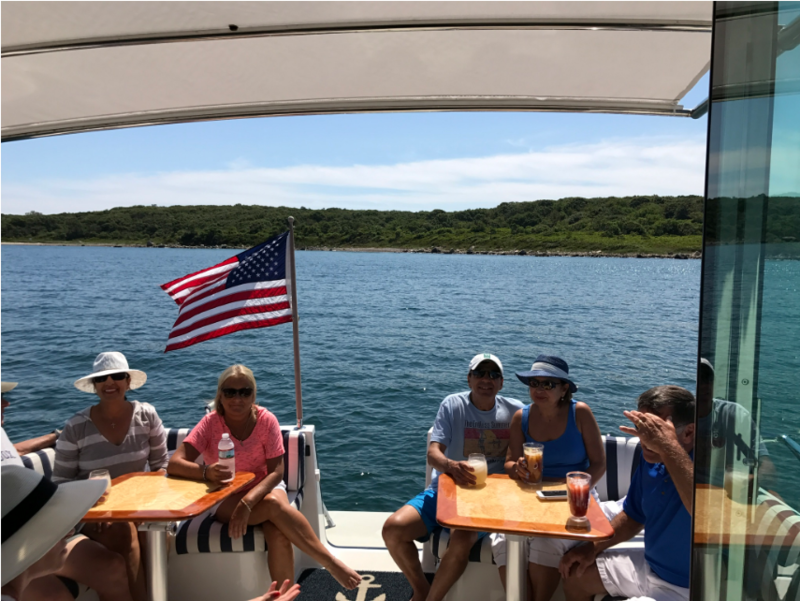 I punched in Cuttyhunk as our new destination and went back and told everyone. As we got close to Nashon Island I noticed a funny little island that I had never noticed before on the chartplotter. With that, destination three went into the Vigilant computer and off we went to anchor on the northwest side of Nashon Island. 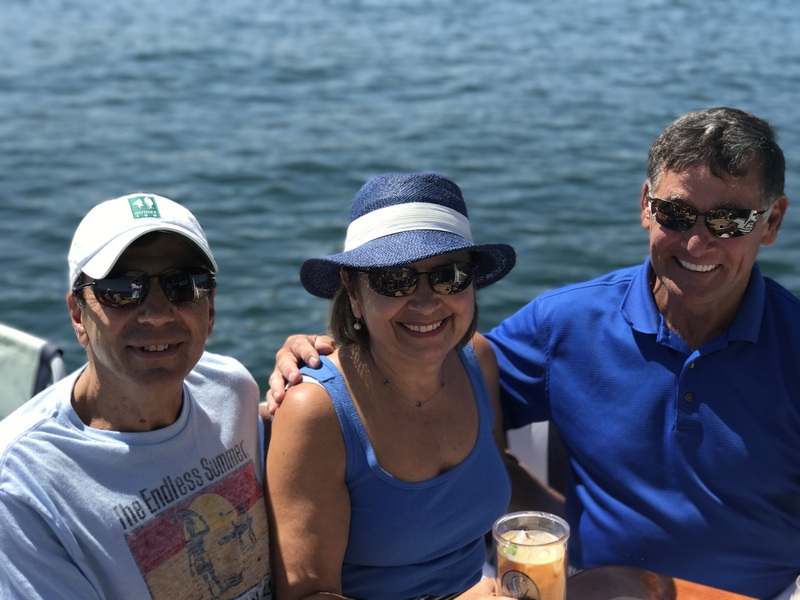 By the time I dropped anchor, everyone on board had “become one” with the day, Buzzards Bay, and each other. Mrs. Horne decided this blessed event needed a name and she proposed Ocean Bay Club. Everyone loved it and thus that has become our official moniker! As you should know by now, I love serving my friends, especially in such a wonderful venue. Although I had set up a bar from Vigilant’s galley before, today would be more challenging. 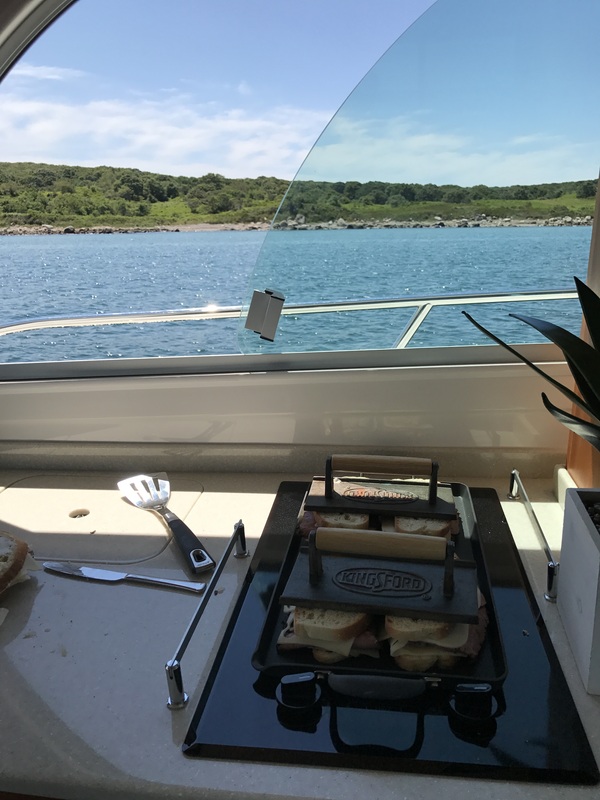 While the original plan called for a Pot Luck with some guests bringing appetizers, other salads, and some deserts, with both boats grilling up so Rubens, that also went out the window. Thanks to the last minute scratch of the 2nd boat, there were no appetizers coming and we ate all the Dulcet Rubens on Tuesday! 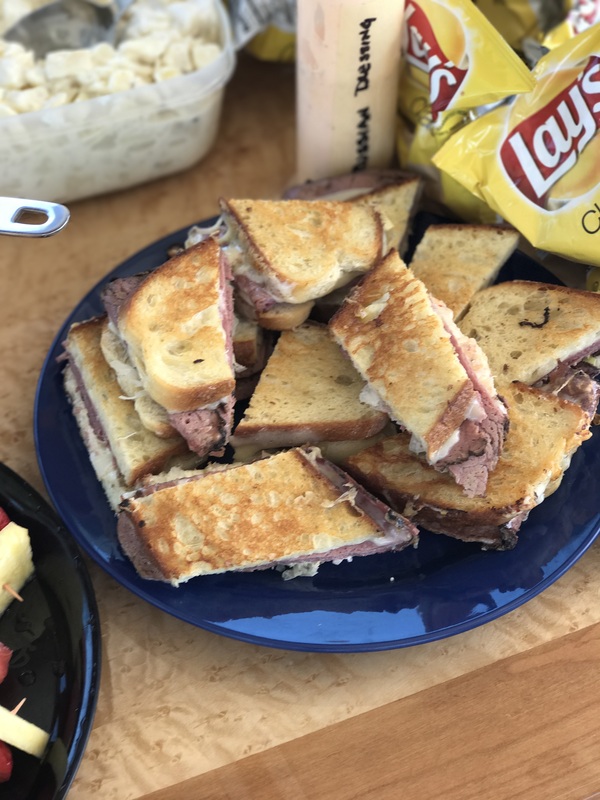 Although we still had salads and a wonderful homemade Zucchini Bread desert (thank you Angela), I knew I’d have to hustle to get drinks and appetizer’s out while trying to grill my famous Ruben’s for 9! Pot Luck on a boat is a little different than at home. You want everyone to get what they want, you want everyone who wants to chip in be able to bring something, but you have very little space for coolers, let alone in the refrigerator. 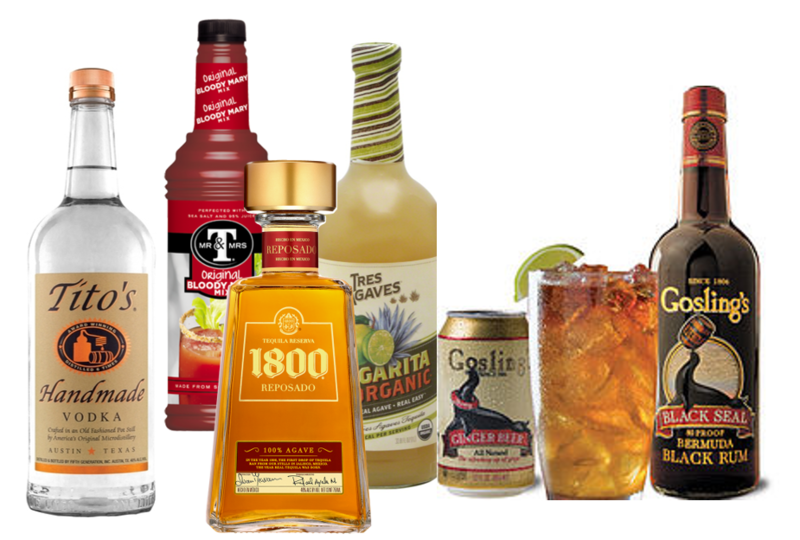 With this in mind, I had announced two theme drinks that I planned to serve – Skinny Margarita’s and Bloody Mary’s. In addition, Captain Paul and Ellen also brought along a Dark and Stormy kit. Within 5 minutes of dropping the hook, the bar was open! Vigilant’s Ocean Bay Club Bar! 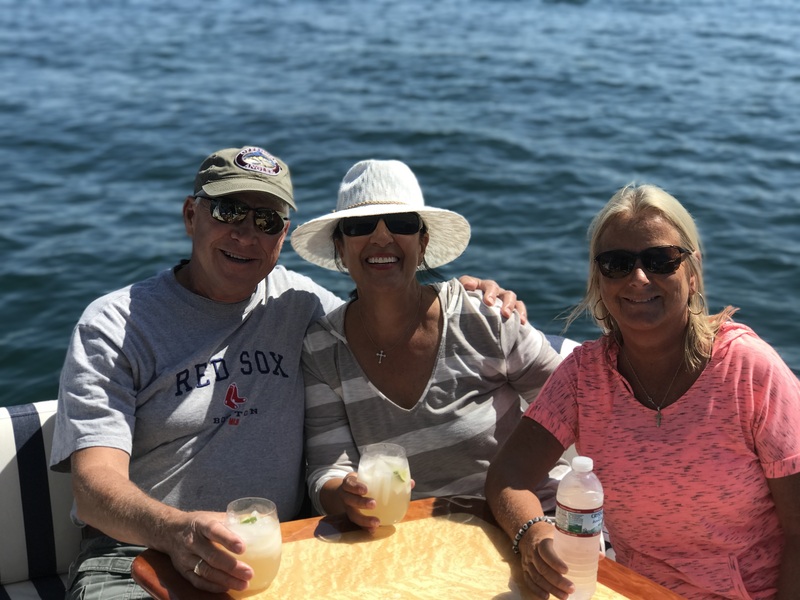 Once our guests had their Island Cocktails in hand, I quickly served up a cheese platter and a lobster dip. If I’d had more time to think about it, I may have created something more sophisticated, but I knew this would do the trick. 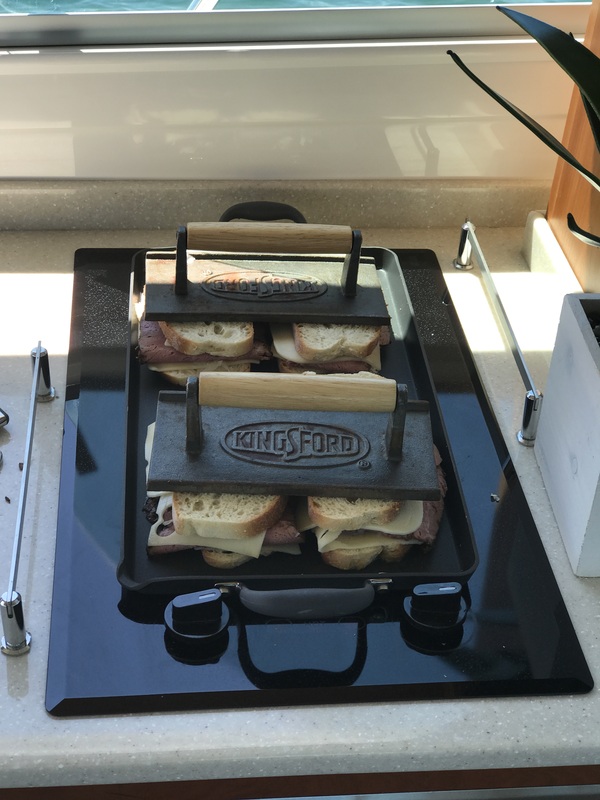 With my guests out back getting into the proper mood, I turned my attention to heating up my grill pan and assembling my Rubens. My biggest concern was having room to set up the bar, assemble my Rubens, and grill on the 7′ galley counter – no problem. I quickly assembled my sandwiches on Pane Bread, with Black Pastrami, fresh Kraut, my homemade Russian dressing, and Swiss Cheese. 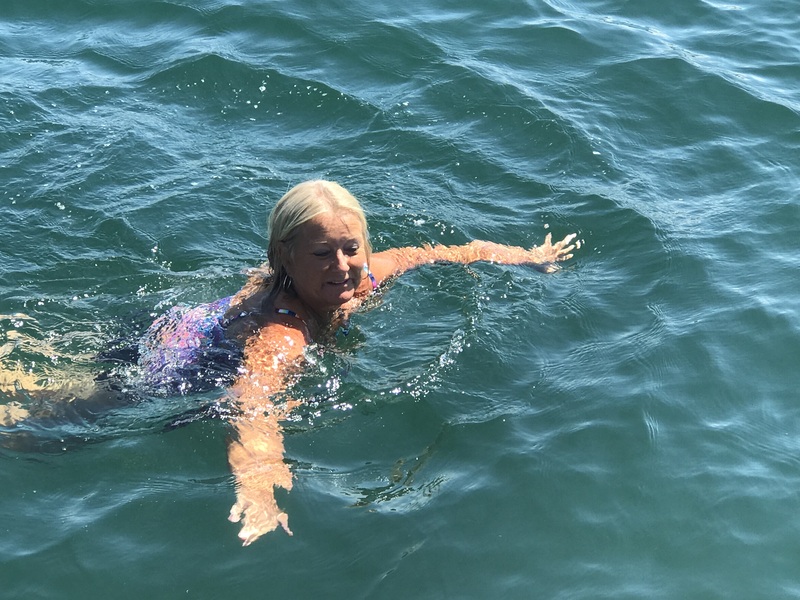 I was fully impressed by how many of my Bay Club friends jumped into the ocean for a swim. According to Vigilant’s water thermometer, they were swimming in 70 degree sea water. 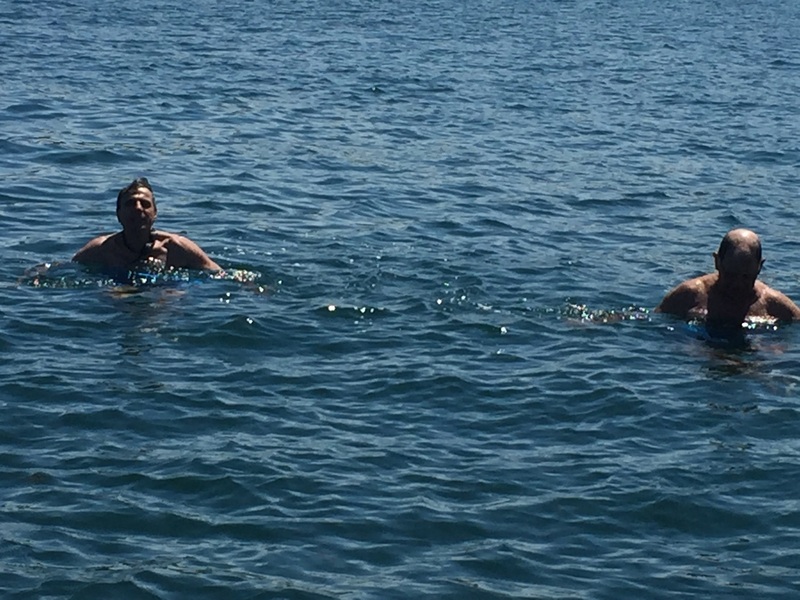 Top honors go to Tony and Dennis for spending the most time in the water, but Liz, Ellen, and even Captain Paul jumped in for a dip. As my friends swam around The Weepecket’s, I broke out my ship’s guitar and started serenading our dear guests. Back Cove offers three choices for the space under the salon rear window; nothing, a gas grill, or the bench seat we ordered. We don’t plan to cook a lot of dinners on Vigilant and often have 6-8 guests, so we opted for the bench seat option. Little did I know that it would be the perfect little stage for my music. Tony requested the music, but it’s still a little tricky pulling out your guitar and performing in front of friends in the confines of Vigilant’s back deck. In many ways it’s more intimidating than playing in front of a couple of hundred strangers. 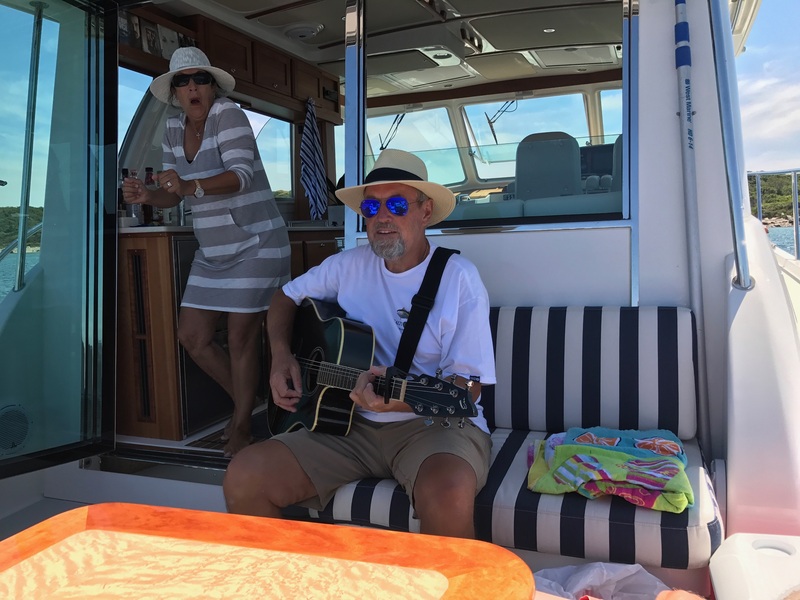 While keeping the drinks flowing helps, I have come to learn that the best way to get everyone into the act is to pick the right songs – Boat Songs! After about 40 minute of tunes, I packed up my guitar and set course for Mattapoisett. Mrs. Horne and the crew were already busy discussing next years trip. I chimed in suggesting we pick a couple of dates and try to add more boats! Our pleasure; hope we can make an annual event!